I have had an outdoor Yucca plant for several years but this is the first time it flowered. Why is that? Plants need to reach a certain age before they bloom. 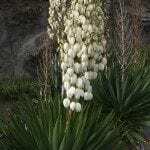 Yuccas normally need a few years before they are old enough to bloom. It will bloom irregularly for the next several years and as it gets older will bloom more regularly from year to year.